This week’s blog post intends to inform UW faculty about the nitty-gritty details of the new scheduling system. Here are a series of useful tips that should help colleagues navigate the new Infosilem scheduling system. Tip 1: Identify your departmental time tabling representative (in some departments also known as the scheduling officer). Make sure that your department has implemented a transparent procedure for requesting accommodation in your schedule. Tip 2: The Registrar’s Office maintains a list of examples of the sorts of accommodations can be requested. Do not hesitate to take advantage of the opportunities for accommodation that are allowed within this framework. Tip 3: Do not hesitate to contact the Registrar’s Office and the Faculty Association (president: David Porreca; administrative officer: Pat Moore) with any problems you face with the new system. We shall be compiling these to help make the implementation of the new system as beneficent to faculty colleagues as possible. I’m going to go out on a limb here and suggest at least 99% of instructors and 100% of students do not want a Friday afternoon class scheduled later than 4:30 pm in the Spring term. So I would love to see the Registrar’s Office (RO) schedule the Spring term with no classes after 4:30 on Fridays. That should be extremely easy to input in Infosilem software and I strongly suspect it would yield no noticeable degradation in the quality of the scheduling objectives (elective satisfaction rate or others). In fact, I would hope the RO is capable of running two simulations (Fridays end at 4:30 vs Fridays end at 5:30) to evaluate if an early end to Friday classes does in fact notably degrade the schedule quality. The above paragraph is a simple example of a useful exercise in modelling called scenario analysis. Understandably, the RO is still learning and developing skills needed to run the Infosilem software and as such they have yet to do any types of scenario analysis FAUW is aware of (i.e., build multiple schedules under alternative inputs). However, I’m sure most readers as well as RO staff can think of very important and useful scenarios that should be evaluated. As such, FAUW will continue asking the RO to build their capacity so that they can evaluate alternative scenarios. You could help by asking a Provost’s Advisory Committee for Timetabling (PACT) representative or your timetabling representative to request that the RO commit to evaluating alternative scenarios and thus plan to build multiple schedules with Infosilem every term. Questions? Comments? Please respond below or to the FAUW President, David Porreca. The Ministry of Training, Colleges and Universities (MTCU) has requested that all Ontario universities update and re-submit their Strategic Mandate Agreement. For reference, the original 2012 draft (PDF) and the current draft (PDF). The deadlines imposed by the MTCU have left only just enough time for consultation with faculty members, with the latest draft of UW’s SMA submission being discussed at a special meeting of UW’s Senate this afternoon. Although at times jargon-heavy – “intrapreneurship” left this francophone and latinist baffled and scurrying for an etymological dictionary – the draft does a good job of selling UW’s strengths, borrowing heavily from the recent Strategic Plan. In this context, I note in particular the wording “including, but not limited to, quantum science, water and aging” (emphasis mine) in a crucial passage under the heading “Transformational Research”. This welcome modification to the controversial original formulation brings the document closer to embracing the full variety of research that is done on our campus, but members in certain disciplines will still find themselves searching for their proper place within the vision of UW described in this SMA. Finally, the MTCU imposed strict length limits on these SMAs, which limits the depth of the proposals. With one’s expectations adjusted accordingly, it represents a palatable and at times even eloquent expression of what makes UW different, clearly destined for a political audience. Fill in the survey that was distributed along with the simulated schedule materials. 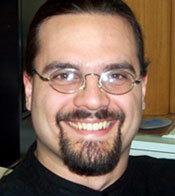 Contact the scheduling representative of your department. The new extended deadline for feedback is 13 January. That’s all for now! In the upcoming weeks, we will feature more fulsome assessments of the new scheduling system, the results of the Digital Privacy Colloquium held on 4 December, and other news, as it always arises. With best wishes for happiness and productivity for 2014! It has been an extremely busy start to the Fall term. Now that we are at the mid-way point, it is time to provide you, dear reader, with an update as to what has been keeping us at FAUW on our toes over the past several weeks. The task force on the Approved Doctoral Dissertation Supervisor status regulations is pursuing its work with a view to reporting to the Faculty Relations Committee and the Graduate Student Relations Committee in November. We are looking at solutions to ensure good graduate supervision that meets students’ needs while addressing the manifold concerns with how the current ADDS policy is communicated, applied and enforced. At FAUW’s request, the Provost’s Office has written to each individual faculty member who has been hired in the past 6 years to inform them of the current policy, and equivalent language has been included in employment letters for those colleagues hired this past year. Since doctoral dissertation supervisors can belong to a number of different categories of faculty members (e.g., visiting, clinical, tenure-track, tenured at UW, hired with tenure from elsewhere), the eventual policy would need to be formulated in such a way as to address the issues relating specifically to each one. I am very pleased to announce that our colleague Christopher Small from Statistics and Actuarial Science had kindly agreed to replace Peter Van Beek as the Chair of FAUW’s Academic Freedom and Tenure Committee when the latter ends his term of office at the end of August 2014. The AF&T Chair is a challenging position that can have an enormously positive impact on the careers of our members, and we at FAUW are very pleased that Christopher has expressed such keenness to take on the role. There is no controlled access to the change rooms (e.g., turnstiles), which is commonplace in most reputable athletics facilities. All staff members who dispense towels and oversee the (otherwise) uncontrolled access to the change rooms must walk through the men’s change room area in order to gain access to their office space. Upon examination of the floor plan of the PAC, it turns out that the female change room is about ½ the size of the men’s. Unless there is a demonstrable difference in usage rates between the two groups, this layout is evidently problematic from an equity perspective. A rough estimate sees 1/3 of the lockers in the men’s change room being broken and unusable, and another 1/3 being unused (those with the locks upside down). In other words, the space is under-used by a substantial margin. The lockers are in a deplorable condition, and we should all be grateful that campus ambassadors do not take visitors through the change rooms. 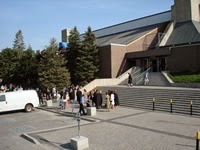 If all groups of stakeholders – faculty (FAUW), staff (UWSA), graduate students (GSA), undergraduate students (Feds) and the university administration (via Athletics or the Provost’s Office) – could come together to fund such renovations, all the stated groups would benefit at a modest cost to each. Also, feedback from female colleagues as to the state of the women’s change rooms at the PAC would be greatly appreciated. Please comment below or e-mail the FAUW president at dporreca@uwaterloo.ca. FAUW’s Status of Women and Equity Committee (SWEC) produced a 6-page report on “Best Practices in Hiring” for faculty members. This document has received endorsement by Deans’ Council and will be presented to the Executive Council of the university in late November. Recognition of the need for such a document at those high levels of university administration is an encouraging sign to be sure, as long as we eventually see proportional corresponding action. Some of you have been asking about how faculty memberships at the Grad House work. Henry Ensley, manager of the Grad House, has written a letter explaining how it all works. FAUW is being consulted on what shape we would like to see course evaluations take in the future. Discussions will include student representatives and qualified staff from CTE. If you have strong feelings or ideas you’re willing to share about course evaluations, please comment below or e-mail the FAUW president at dporreca@uwaterloo.ca. That the province needs to fund an independent study on the working conditions of contract academic staff across the province in order to help resolve long-standing concerns about their job precariousness, lack of real academic freedom and potential for exploitation. That the province needs to provide temporary solvency relief to university sector pension plans for those institutions that need it. We had been asking for a 1-year extension of such relief in order to give enough time to OCUFA to complete its study on university-sector pension plans. Much to our relief, however, in the middle of our meeting sessions, news came out that the province had granted a 3-year window of solvency relief. That the province needs to restore funding to its faculties of education. This question did not concern UW as much, so I shall not belabour it here. That the province need not incentivize differentiation between universities in the province because institutions of higher education are already plenty differentiated as it is, from small liberal arts colleges to the University of Toronto, with UW standing out – among other things – for its long-standing commitment to the co-op stream and for having a full Faculty of Mathematics. Our messages were well-received, in particular, the first point, with members from all three parties agreeing to request such a study from the Minister of Training, Colleges and Universities. FAUW is anxiously awaiting the results of the latest simulation of the new scheduling system, as discussed in last week’s post by Bryan Tolson. The Secretariat has announced plans to undertake a full-scale revision of the Senate bylaws. The first phase of this initiative is restricted to housekeeping changes, but revisions to Section 5 (selection of members of the Senate) are being left for last as they are more likely to be substantive. These revisions require great vigilance to ensure that nothing deleterious to our working lives as faculty members happens as a result of the proposed changes. Faculty senators are encouraged to exercise active vigilance when these documents become available for consideration. The Secretariat is also undertaking a full-scale multi-phased revision of all 69 of UW’s numbered policies (still listed as 1-77, with some gaps). The first phase will involve housekeeping changes (e.g., regularizing and updating the names of buildings and offices that are mentioned in the policies), but later phases will also involve substantive changes. Through the Faculty Relations Committee, the approval of the Faculty Association will be necessary for any changes that are to be made to Class F, FS and A policies. FAUW plans to devote substantial time and energy to make sure that any changes are favourable to faculty members’ interests. The numbered guidelines and procedures will also be subject of an eventual analogous revision. The joint FAUW/Provost’s Office Work-Life Balance Report that was presented to Senate back in February 2013 is becoming integrated purposefully into the “Value System” focus area of UW’s newly released (but-not-yet-fully-Senate-approved) Strategic Plan. FAUW’s Status of Women and Equity Committee produced a “Compassionate Care and Bereavement Leave” report that will be considered in conjunction with the WLB report at the same level. Privacy Colloquium: Wednesday, December 4, 2 – 5 in M3 1006, with reception to follow. UW continues to move closer to implementing a proposed new scheduling system based on InfoSilem software. FAUW has been working hard to understand the impacts of the proposed system and has taken the position that the new software should not be implemented until it has been clearly demonstrated that it produces better results for all stakeholders than what we currently have. The Provost has agreed to this request. We want to share what we understand about the proposed scheduling system and urge you to join the discussion on this important issue. As we all know, the inherent flexibility in course scheduling is one of the principal benefits of being a faculty member. This benefit functions to improve our work-life balance and allows us to do our jobs to the best of our ability. For some of us, this means that we get to teach when we believe we teach best. For others, it means we get to define blocks of time for research tasks and regular out of town research meetings and these blocks of time help us work as efficiently as possible. For some, like me, this benefit functions to ensure we can have a life where we can pick up the kids from daycare at a reasonable time or take them to hockey practice. Moving to the proposed system could reduce our scheduling flexibility. Such a change is totally reasonable if it is demonstrably required, e.g., students are not graduating on time under the current scheduling system. It is not so clear-cut given the primary reason for the new system, as FAUW understands, is to provide virtually all students with conflict-free schedules instead of forcing them to settle for their #2 or #3 choices of electives. To me, this lack of clarity defines the scheduling problem as a balancing act between undergraduate student scheduling preferences and faculty preferences (benefits). An unknown and potentially significant number of faculty who are teaching in the 2013 Fall term did not specify their teaching constraints or preferences (you should have been asked for yours by your departmental scheduling representative and the assumption by the Registrar’s Office is that you have been asked). The settings for faculty preferences in Simulation 3 will virtually ensure all faculty preferences are met because all preferences are ranked equally. While in a real schedule build, these preferences would be assigned the lowest priority. FAUW does not know the form of the objective function the scheduling software is actually trying to optimize when it builds a schedule. Another reason Simulation 3 is not accurate is that faculty members were not told what the software could do with individual schedules if preferences to the contrary were not specified. For example, the software settings used in Simulation 3 could create a schedule that has you teaching back to back classes or teaching 5 hrs in one day…unless you specified an instructor preference to avoid these. After I examined all the things the software could do based on the Provost’s Advisory Committee on Timetabling (PACT) documentation for Instructor Accommodation requests, I developed my list of Accommodation requests (my constraints and preferences) that I plan to submit for the next Simulation (or real schedule build). I list them below so that other members can have some insight into the kind of accommodation requests they want to consider. a There are two levels of child care accommodations with Level 1 having higher priority than Level 2.
b By default the software assumes you prefer 2 days of non-teaching and thus squeezes two or more classes per day for one or more days. c Many others will likely ask for this so if I don’t, the chances I teach Friday afternoons skyrocket. d Teaching in the summer is not great because of an increase in family activities. Hence, if I‘m teaching I want my days to end early enough to allow for these activities. Plus there should be more flexibility to build faculty-friendly schedules during the spring term. ure take place. If you are unclear about the definition of Level 1, 2 and 3 accommodations, this is something your chair/department scheduling representative or the PACT committee should be telling you. Go to the same sources for the other potentially undesirable things the scheduling software will enable by default to happen to your schedule. FAUW will eventually step in to clarify these questions to our members if that becomes necessary but we are hopeful the communication lines to faculty are soon wide open. Contact your departmental scheduling representative and make sure you understand how the process in your department works for specifying instructor accommodations. If you are teaching this term, please provide direct feedback to your scheduling representative or chair on your satisfaction with the scheduling results of Simulation 3 (which will supposedly be released within a few weeks). Please respond to the survey you will eventually be asked to fill out regarding Simulation 3. Be aware that the official feedback mechanism to the administration on faculty satisfaction will go through the chair/department scheduling representative and not FAUW. Consider contacting one of your Faculty’s PACT representatives with feedback they can bring to their next meeting. PACT members are listed on the STEP Project website. Each individual faculty member should be empowered to designate a certain number of hours per week of non-teaching time, regardless of the rationale. So far, this solution has been deemed infeasible for reasons that are unclear to us, but we will continue to explore ways in which it can be achieved. Importantly, any such solution must have minimal impacts on our students’ timetabling. Please contribute to the discussion by commenting below. In this week’s blog post, I provide an update on some of the principal issues raised in last week’s post, with a particular emphasis on scheduling. First, a reminder to attend CAUT’s “Get Science Right” inaugural town hall meeting at the Waterloo Public Library on Tuesday 17 September, 15:00-17:00. Our own Melanie Campbell (Physics) and David DeVidi (Philosophy) are among the contributors to the discussion panel. The main theme of the event – the first among many that will happen across the country – is the Federal Government’s excessive and ideologically-driven involvement in how science is funded, conducted and published in Canada. Any faculty member who applies for federal funding for her or his research is affected by the changes that have been imposed upon the Tri-Council agencies (CIHR, NSERC, SSHRC), so this event is a crucial one for the future of primary research in our country. Come join the discussion. 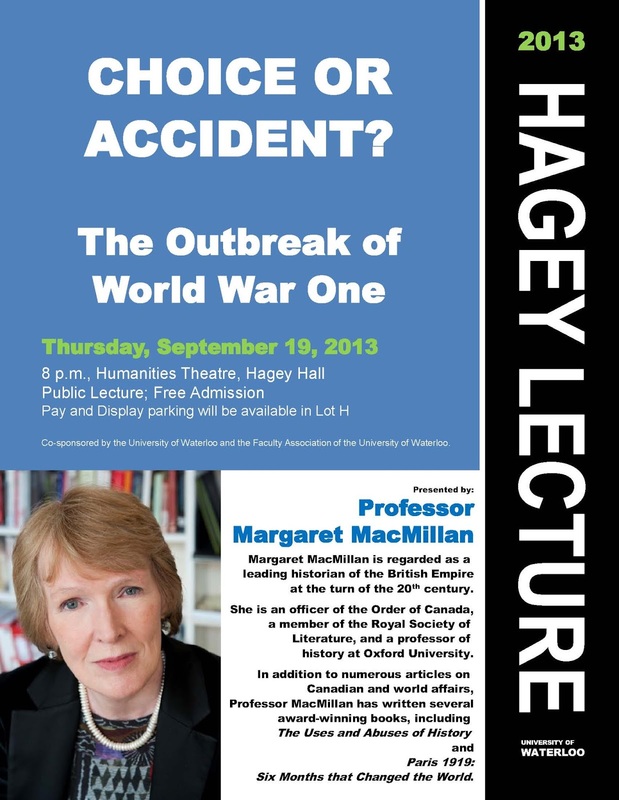 Second, a reminder to attend this Thursday’s Hagey Lecture, where Professor Margaret MacMillan (History, Oxford) will deliver a lecture entitled “Choice or Accident? The Outbreak of World War One”. This free event is held in the Humanities Theatre in Hagey Hall20:00 on 19 September. Planning is afoot for the fact-finding colloquium on financial data security in non-Canadian cloud-based servers. The intent of this event – to be co-sponsored by FAUW, the Secretariat and the Dean of Mathematics – is to inform the University’s decision in purchasing an online expense claims system to replace the now bygone policy on per diems. The target dates for this event will be 4 or 5 December. In addition to the list of administrative positions that UW is seeking to fill that were mentioned in last week’s blog post, the Director of the Office of Student Success is also an important position that remains empty. FAUW is alert to the impact that new people in positions of authority can have, and we are making sure that faculty interests are protected by having proper representation on all of the relevant hiring committees. In fact, from the reports I hear at various OCUFA and CAUT meetings, it becomes clear that having good people on hiring committees is one of the most effective means faculty members have at their disposal to ensure that university operations function as they should. By this I mean that the function of the university is to promote scholarship broadly construed, i.e., the dynamic interplay between research and teaching, faculty and students. Basic job competency notwithstanding, those candidates for upper-level positions who can stand by that vision of a university are generally less likely to make decisions that are harmful to the academe. As a result of discussions over the past week, I am pleased to report that the Registrar’s Office is planning to follow FAUW’s suggestion and supply faculty members with two alternative schedules using real-time data: one as the schedule currently exists using the old methodology, and a second one using the new Infosilem scheduling software. The gathering of faculty members’ preferences between these two options will be coordinated through departmental scheduling representatives and funneled upward to the Registrar’s Office from there. FAUW plans to make sure that the rationale behind faculty members’ expressed preferences also be taken into account. The above good news notwithstanding, FAUW still faces a problem of perception when dealing with the implementation of this scheduling system. Indeed, in our efforts to make sure that the old scheduling system does not get replaced with one that is worse than the system we currently have, FAUW has been perceived as being an obstructionist force. FAUW’s consistent message has been that we want the new system to be better than what we currently have for all stakeholders and interests (students, administrative staff, faculty members and room allocation), and that it should not be allowed to go ahead until such time as it is demonstrated to all stakeholders’ satisfaction that it is in fact better. Time allocation is every faculty member’s most critical zero-sum game, so this new scheduling system has the potential to be very disruptive to our work environment if it is not done right. Having a scheduling system that is known to be disadvantageous to faculty members is a very effective anti-recruitment and anti-retention tool for top professorial talent (as was the lack of adequate daycare facilities, an issue that is about to be resolved in no small part thanks to FAUW’s intervention). If UW is to live up to its claimed reputation as a top-notch research institution, it would behoove it to make sure it has a scheduling system to match. This post is intended to bring our membership up to speed on the latest developments regarding the new scheduling software being tested by the Registrar’s Office. The discussion below is based upon a presentation and Q&A session held with Ken Lavigne at the most recent Faculty Relations Committee meeting on 14 March. The new scheduling software, known as “InfoSilem”, has the capability to have groups of buildings (i.e., “pavilions”) assigned to a specific academic unit such that that unit’s classes will only be held in those buildings. In other words, for example, the English Department might choose “Hagey Hall, Arts Lecture Hall, Modern Languages, and PAS” as their ‘pavilion’, and therefore never again have to run to RCH or Optometry to teach a class. The new scheduling system will not be “going live” at least until the Spring of 2014, since results from further testing of both Fall and Winter terms are needed to optimize the new system. In effect, the Registrar’s Office has been proceeding as if it were following FAUW’s call from a number of months ago that the new system not be implemented unless and until it be recognized as “better” than the system we have in place. Although FAUW’s role is to look after the interests of faculty members, we understood “better” to apply to all stakeholders (including, e.g., students, grad studies, scheduling officers etc.). If the testing from Fall and Winter prove to be sub-optimal, the Registrar has agreed that the implementation will be delayed further. In the current iteration of testing, any scheduling restrictions expressed by faculty members have been inputted as if they were the most strict and rigid (“type 1”, according to InfoSilem’s ranking system, corresponding roughly to “medically necessary non-teaching time”; 2 other less restrictive layers are to be tested in later increments). Despite this additional restrictiveness, the system produced schedules for those departments that participated in the testing so far that guaranteed at least two non-teaching days for 92% of the professorate, up from 87% in earlier tests. In other words, we can expect further improvement on this front when the real-world, less-restrictive constraints are applied. Offering faculty members the opportunity to block off time in their schedule when they would rather not teach is how the tests have been proceeding so far. Better yet would be a way of optimizing each professor’s schedule such that their individual schedules reflect the times when they want to teach. Pedagogically, the latter is by far preferable, since UW students deserve to interact with their professors when they’re at their best. It should be noted as well that the decisions regarding the levels of constraint mentioned earlier will be handled at the departmental level, just as it always has been, with no centralized awareness of the often confidential reasons for preferring some times over others. If the tests are to accomplish their intended goals, all departments must participate, otherwise the tests will be skewed. Only ~70% of departments have participated in the simulations so far, with only ~1/2 of graduate programs included. For this Fall term, FAUW is pushing for each individual professor to receive a copy of their hypothetical “InfoSilem” schedule to compare to the real one they got under the current system. The testing of the InfoSilem software is revealing significant disparities between academic units on campus in terms of how scheduling is handled at the moment. Some units already ask for each individual’s preferred teaching times, which they tend to obtain for the most part, while elsewhere, faculty members have never, ever been asked such a question and have always accepted whatever schedule they’ve ended up with. In other words, the change in practice with InfoSilem will affect the working lives of some more than others. FAUW will be monitoring this situation closely, and we welcome feedback on how the testing of this system is experienced subjectively by you, our members. To Provost or Not to Provost? Well, as many of you already know, our institution had a heart attack last week. Dr. Sallie Ann Keller resigned from the position of Vice-President Academic and Provost (VPAP) after nine months on the job. UW did the right thing in not signing on to Access Copyright’s framework. Instead, we have developed our own set of copyright guidelines that are described in full in the UW Copyright FAQ. UW’s satellite campus in Dubai is closing. The opening of this campus was actively opposed by the Faculty Association from the get-go for a variety of good reasons, including the lack of a credible business plan for the project, and the impossibility for all UW policies to apply on that campus (e.g., an openly gay faculty member would be committing a capital offence the moment they set foot off the plane in the United Arab Emirates). Inequities surrounding benefits for couples who are both UW employees have been resolved. The railroading of a new scheduling system with inadequate communication and inadequate consultation with key stakeholders had been slowed, such that all interested parties can get their concerns integrated into the deployment of the new system over the next year or so. After unconscionable delays and consequent mushrooming of costs, the construction of a consolidated daycare facility for the university community is finally going ahead. The approaching resolution of issues around the collection and retention of confidential medical information from those applying for Short-Term and/or Long-Term Disability benefits. Implementing regular, systematic checks for faculty salary anomalies and their adequate resolution. Per diems. Reports keep coming in that other institutions (e.g., the University of Toronto and McMaster University) have managed to retain their per diem systems for expense claims despite the apparent imposition of provincial regulations. Investigations are ongoing on the applicability of the systems deployed at those institutions to UW. Senate Long-Range Planning Committee oversight of satellite campuses. We are aiming to set in place regulations that will prevent the occurrence of future debacles such as our Dubai campus. Defining satellite campuses is a key component of this issue. Pensions: Not everyone is happy with the changes to our pension plan that were put forward last year for implementation in 2014. Efforts are ongoing to improve the situation through broader consultation. The Work-Life Balance Report authored by DeVidi, Parry, Collington, Clapp and Brown contains a number of sensible recommendations to improve our working conditions. The exact mechanisms for the implementation of the Report’s recommendations are still under discussion. Concerns over the inadequacy of UW’s provisions for compassionate care and bereavement leave have been raised and distilled into a report for FAUW’s Status of Women and Equity Committee. The implementation of this report’s recommendations is also under discussion. Having biennial evaluations for tenured faculty members is an issue that has been raised many times over the years which we will be looking into more closely. Well, there you have it: the good, the “in progress” and the “yet-to-do” lists. The length and significance of the first two are a testimony to the good working relationship the Faculty Association had with Dr. Keller. We look forward to having an equally productive relationship with Dr. Geoff McBoyle who will be returning as the interim VPAP, as well as with his eventual permanent successor.